People who create crop circles are being urged to consider how their actions affect farmers' livelihoods. The patterns started to appear again in Kent and Sussex with the onset of summer and now cereal farmers are urging the pranksters to stop. The National Farmers' Union (NFU) said damage is made worse by so called crop circle tourists who trample on crops making them impossible to harvest. 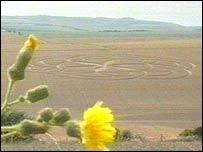 The NFU believes the circles are man-made and not created supernaturally. David Taylor, a farmer in Falmer, near Brighton, said: "The problems it causes are first of all the damage caused by the crop circle itself which is something we have to put up with. "But then the problem experienced after that is the public get to hear about it and they walk across the crop to look at it and trample the crop down within the circle and that causes greater economic damage than the circle itself." An NFU spokesman said: "Creating crop circles is akin to trampling over someone's back garden - it is unfair and irresponsible. "Crop circlers seem to forget they are damaging someone's property and there is a financial implication. "The crops, which have been carefully nurtured, cannot be harvested easily when they have been knocked flat. "But people who walk in the crop circle trample the crops down further and then they really do become impossible to harvest."